Gertrude S. Carraway, born in New Bern in 1896, was a newspaper woman, a publisher, and a historical researcher of such note that the Sun Journal once said she “made history while studying history.” She published “The Flying Marines” in 1946 and gave a detailed portrait of MCAS Cherry Point, commanding officers, and newly-built structures in its early days. Gertrude included a section on women Marines, an article about the base during WWII, and an “interesting personages” section to showcase entertainment and sports stars and military heroes who served at Cherry Point. Historian Edward Ellis was fortunate enough to get to know Gertrude personally in the 1980s through his membership in the East Carolina Genealogical Society. She proudly told Edward that the nearly 40 pages of ads in the back of the pamphlet pulled in enough revenue to allow her to travel all over the world. This advertising now serves as a kind of time capsule of communities from New Bern to Atlantic Beach. You can read “The Flying Marines” in its entirety here. The film “Wings of a Marine” tells the story of Second Lieutenant William T. Smith. Produced in 1965, the film follows Smith’s career path, from the completion of his basic flight training to his entry of the A-4 pipeline where he flies the Douglas A-4C Skyhawk with VMA-225 Vagabonds. The majority of filming took place at MCAS Cherry Point and shows what life was like for Marines in the 60s, including living in officer’s quarters, classroom training, electronics guiding system training, and taking the first flight. For an amazing look what the base was like more than 50 years ago, watch the complete film here. Hmmm…. is there a ghost on base? A popular legend among personnel at MCAS Cherry Point is the ghost of Kissie Sykes, a woman buried there with her two children long before the base existed. According to the most popular story, early in the construction of the flight line Kissie’s gravesite was moved to make room for the project. The legend states that she was separated from her children in the process and she is now said to be forever searching for them. Syke’s grave is located in a graveyard close to the gas chamber aboard the air station—one of 15 on the premises. She is said to roam the flight line, housing areas, and other parts of the base looking for her children. Learn more about the legend of Kissie Sykes here. 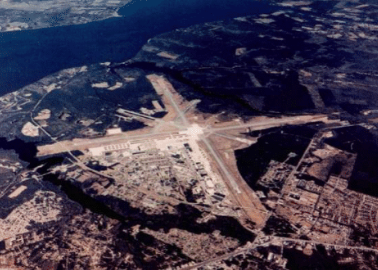 The recorded history of the land that is now MCAS Cherry Point is centuries long and filled with amazing stories of Native Americans, early European settlers, Civil War battles, Space Shuttles, and so much more. DID YOU KNOW? The area now occupied by the base used to be the home of thousands of Neusiok Indians. In the early 1700s they were forced off their lands by white settlers and many of their trading paths became routes for North Carolina’s major highways. The spot where Miller’s Landing Club now sits is where, in 1862, 60 Union ships landed at the mouth of the Slocum River for the Battle of New Bern. It was an important win for the Union troops, and a first step toward the subsequent Battle of Fort Macon. Cherry Point served as an alternate landing site for the Space Shuttle in the 1980s. The runways at the air station were widened from 200 to 400 feet making them accessible as an emergency option for the spacecraft. Get a sample of the Havelock and Cherry Point history you’ll discover from Edward Ellis here. DID YOU KNOW? When MCAS Cherry Point opened in 1942 it was originally known as Cunningham Field. The base included an industrial complex where civilians maintained and repaired warplanes. With most local men overseas during World War II, Cherry Point relied on women from all over ENC for its work force. Georgia Rae Dickinson worked at the base from 1943 to 1945. She commuted from Morehead City where she also volunteered at the local USO. Discover more about Dickinson’s time at MCAS Cherry Point here.